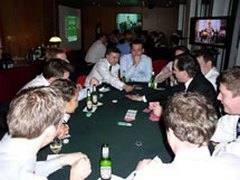 Not a land based casino, Viva Vegas hire out equipment, staff and advice to hold your own events. Catering for weddings, birthdays, corporate events and charity fundraisers, they will tailor the night specifically to your needs. Games you can choose from include American Roulette, Blackjack, Craps, Wheel of Fortune, Stud Poker, Baccarat, Chuck a Luck, Golden nugget and One Arm Bandit machines. Equipment can be hired for photographic purposes or filming or even purchased.